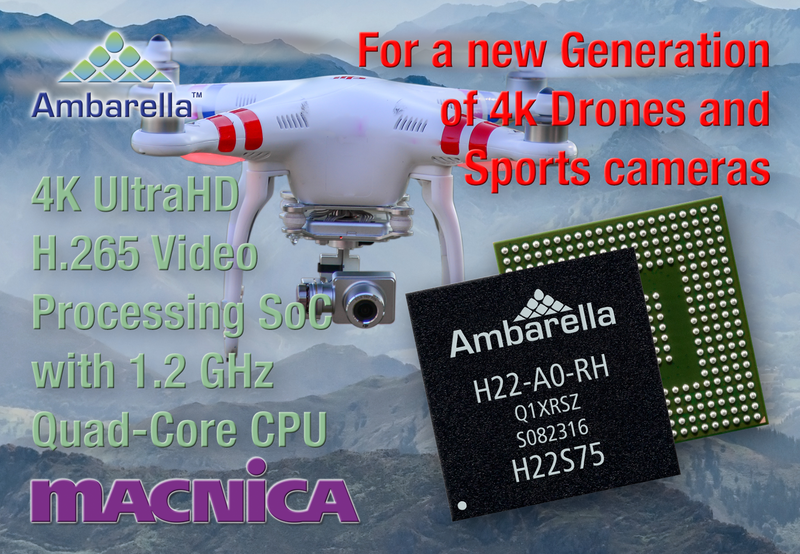 SANTA CLARA, Calif., January 5, 2017 — Ambarella, Inc. (NASDAQ: AMBA), a leading developer of low-power, HD and Ultra HD video processing semiconductors, today introduced the H22 System-on-Chip (SoC) targeting a new generation of 4K drones and sports cameras with leading-edge video features. The new H22 SoC is capable of encoding 4K Ultra HD video at 60 frames per second using the H.265 (HEVC) or H.264 (AVC) video formats, and supports advanced Electronic Image Stabilization (EIS) up to 4K resolution. The on-board 1.2 GHz Quad-Core ARM® Cortex®-A53 CPU provides significant processing power for customer applications including flying camera flight control, advanced analytics, video stitching and wireless networking. Fabricated in 14nm process technology, the H22 offers very low power consumption, enabling 4K cameras with small form factors and extended battery life. The H22 includes a highly optimized image processing pipeline with excellent imaging and advanced noise reduction, and a hardware de-warp engine to support wide-angle panoramic designs with minimal distortion. The device’s 4K EIS can augment or potentially eliminate the need for a mechanical gimbal in a drone. The ability to encode at high frame rates, including 4Kp60 and 1080p120, delivers smooth slow motion, high definition video even during fast action shots. A typical use case for the H22 in a drone might be to simultaneously encode 4K Ultra HD video, stabilize it in real time using EIS, and execute flight control algorithms using input from an array of sensors including an optical flow sensor. Additionally, a second, low-delay, Full-HD live video stream may be processed, encoded and wirelessly transmitted to the pilot for monitoring and camera control.